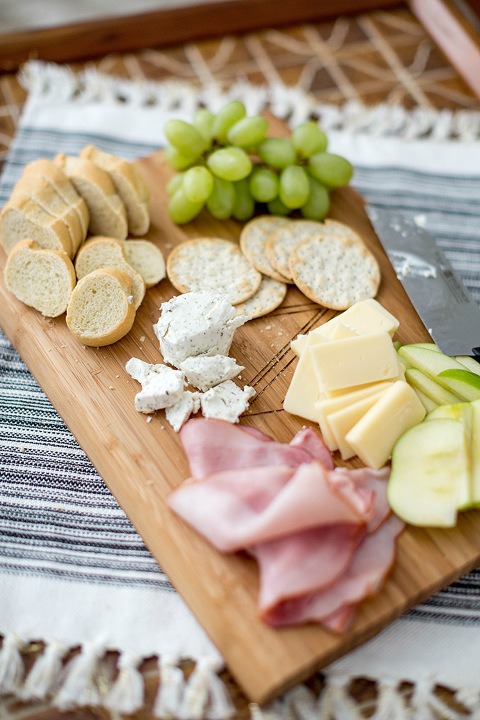 If you were to ask what my favorite dinner is, you’d likely hear a quick reply: “Wine and cheese!” There’s just something so classic, so simple about the combination of flavors, plus I’m a sucker for finger foods. Suffice it to say, my idea of the perfect casual gathering of friends and family almost always revolves around a tray full of wine-filled glasses and a board layered with sliced cheeses and accompaniments. Have you given an at-home wine and cheese party a try? Even if you invite just a couple of other people over, the occasion almost always results in some pretty fantastic conversation and memories. 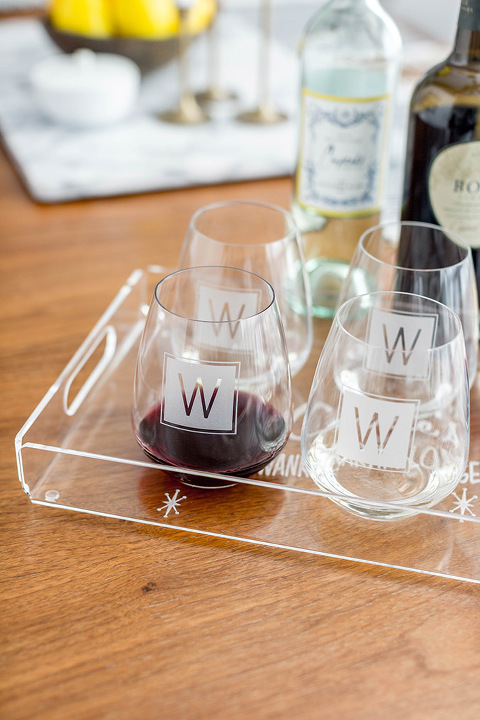 Today, I’m teaming up with Personalization Mall to share a few tips for putting together your own wine and cheese party (complete with custom trays, cutting boards and monogramed glasses), so scroll on for my entertaining advice, plus see it all unfold in real time with a video at the end of the post! Since these types of exclusively-designed monograms and details are always free at PersonalizationMall.com, I didn’t have to worry about overspending for this party. Really, this type of gathering can be downright cheap when you start thinking about it! Middle shelf wine bottles are often well within budget and pack great flavor (I never can tell the difference, although I probably shouldn’t admit that), and a couple of high quality middle range cheeses go a long way, too. Think: $5 or less for each of your wine and cheese choices. 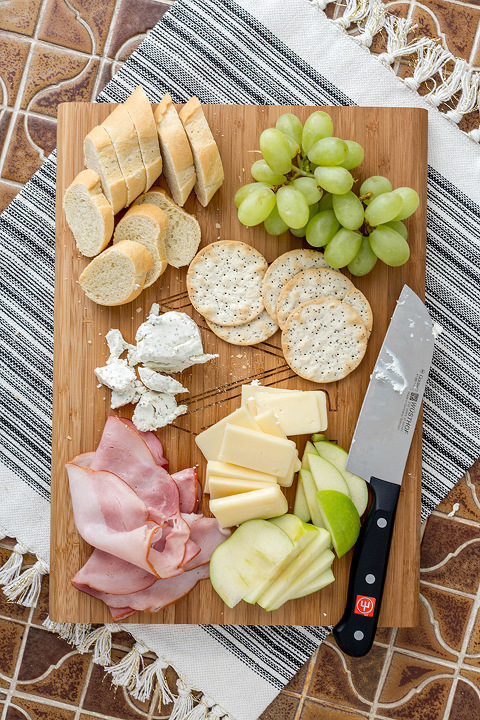 As for cheese board “accessories,” we love to serve things like sliced french bread, crackers, fruit like grapes and green apples (these especially complement cheddar cheeses), plus a few meats like ham and salami for a savory finish. As for sips, make sure to serve at least 2-3 different types of wine and include both white and red varieties, that way you won’t leave anyone’s taste or preference out. Don’t forget to have a carafe of water available on the side though, just in case! Trying the different combinations of sips and bites is what makes this meal so fun and even a little interactive. Consider making handouts that list the food and drink varieties, then have people share their favorite pairings and notes. Offering this type of list with all of the cheese and wine names also allows everyone the opportunity to recreate their personal favorite flavors and combinations back at home. Ultimately, don’t feel the need to splurge on your wine and cheese party. The main focus of this type of gathering is conversation and experiencing a range of flavors, so consider focusing your investment on customized serving pieces that will last through hundreds of parties in your home rather than just one night. Sure, the brand behind said serving pieces sponsored this post, but I’m being completely honest when I say that my confidence in how this party unfolded was because of the foundation pieces I ordered beforehand. 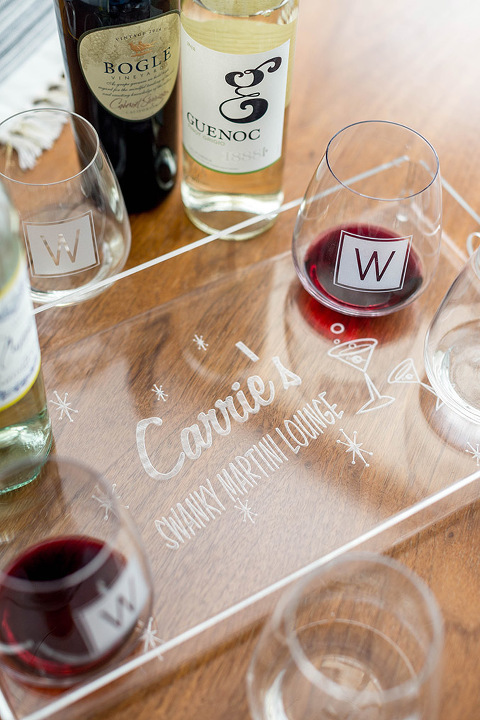 As you’ve probably gathered, I’m no expert when it comes to wine, and my palate for cheese is hardly refined, but I know what I love to eat and drink, and our monogrammed trays and glasses helped make me feel like my guests enjoyed themselves, too. One final tip? We actually served everything—from the gourmet cheeses and fruit, to the three different wines—right on our coffee table, and had our guests sit on floor pillows around the table. It doesn’t get much cozier or casual than that, but the event still felt ultra fancy. It’s all about balance and enjoying the company of your loved ones over delicious handpicked flavors. Click “Play” on the video above to see how I brought this casual fête to life in our home, and let me know what types of finger foods and wine or cocktails you love to serve in your own spaces by leaving a comment below!